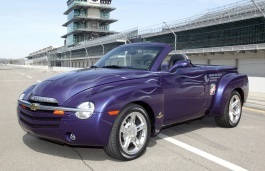 Correct Wheel Sizes, PCD, Offset, Rims and Tire specs for Chevrolet SSR series. These specs are incorrect. All SSRs have 19" on front and 20" on rear. Hi,Scotty q,the stock wheel size for front is 19*8.5 and 20*10 for the rear.And in fact,you can also use both 19'' wheels.It depend on your side.